CENTERPIECE ❧ Federal environmental enforcement is threatened under EPA Administrator Scott Pruitt, echoing the Anne Gorsuch years. But enforcement provides the force that is needed both in achieving compliance and in encouraging responsible companies to innovate and reduce costs. Copyright ©2018, Environmental Law Institute®, Washington D.C. www.eli.org. 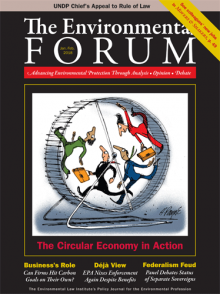 Reprinted by permission from The Environmental Forum®, January/February.